Sasaki Time: Chocolate Chip Cookie Dough and Cheesecake Bites Recipe! 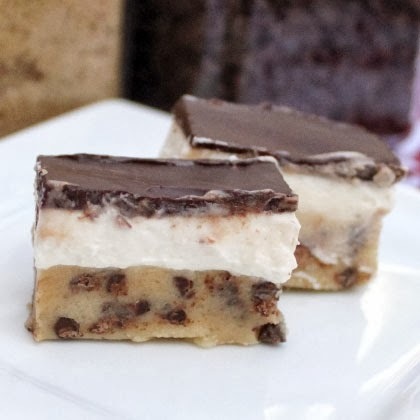 Chocolate Chip Cookie Dough and Cheesecake Bites Recipe! Cream together butter, brown sugar and vanilla extract until smooth. Add flour until a soft dough forms. Fold in chocolate morsels. Press cookie dough layer evenly into an 8x10 pan with straight sides. Blend cream cheese with powdered sugar until smooth. Fold in heavy whipped cream. Spread over top of cookie dough layer and cover with plastic wrap so that wrap is not touching the cream cheese layer. Refrigerate for 2 hours. Melt chocolate chips or coating until smooth and spreadable. Spread over cream cheese layer evenly and refrigerate for another 2 hours or overnight until firm. Cover with plastic wrap that is not touching the chocolate top layer. Let stand at room temperature for 10 minutes before cutting with a heated and dry knife.